The Papergirl Project was completed last Saturday, when the pictures were handed out in Blackburn town centre. We are very excited to tell you that we have already had 3 replies about our children's work! Thank you for your art work, It's very good. I have a granddaughter who is also six and it's quite funny she has a cat that looks just like the one you did, Daisy is a cute cat but only has three legs. Are you getting excited about Christmas? I bet you are also getting ready for a school concert. Be good Be happy and thank you again for the art work I have put it on my fridge with Olivia's work. We also had an email from a group of Manchester Students that received Ebony's picture, who also sent us a wonderful photograph! We are students from the University of Manchester. Today, I was fund raising in Blackburn for Make a Wish UK when I was handed this amazing piece of art! It's by Ebony (age 6). 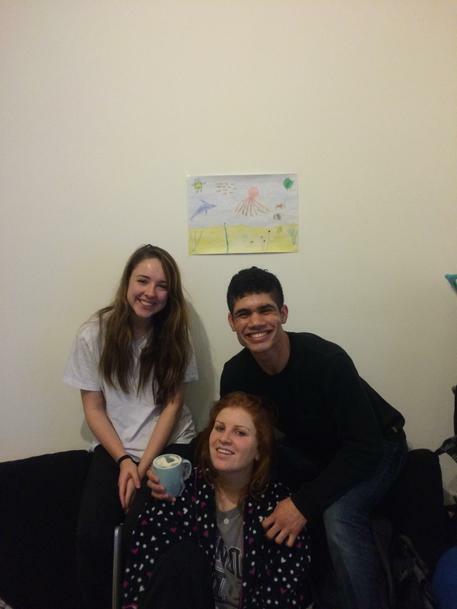 It's the first piece of art that we have in our student home and we love it! Thank you for making our living room a bit brighter and making us all smile! We also had a phone call from a Mrs Jean McGuiness who received Simon's dinosaur picture and Edward was very excited to hear that his fantastic picture of a pirate had gone to Miss Hargreaves' big brother! What are the chances of that?! The children loved producing the pictures and it has been so lovely to hear from the people who received them. Thank you so much for taking the time out to send us a message.